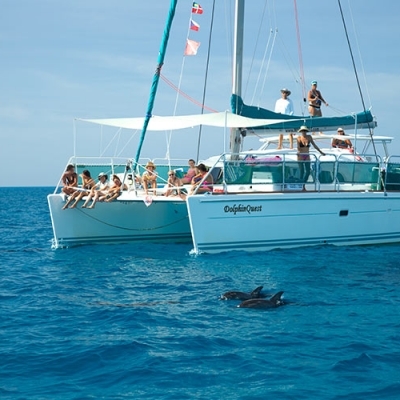 DolphinQuest is a ‘Lagoon 410’ sailing catamaran. She is docked right on our doorstep at the Retreat Centre. Sailing or motor cruising, she offers us the simple, steady beauty of being on the ocean. The boat is comfortable inside and out, with plenty of places to relax in the shade or sun and soak up the stunning scenery. There is a marine toilet (head) onboard and wide rear steps (transoms), which allow easy entry in and out of the water. We usually motor out (surprisingly quiet) of the bay to meet the dolphins. When the breeze picks up, we sail along, harnessing the loveliness and power of nature. 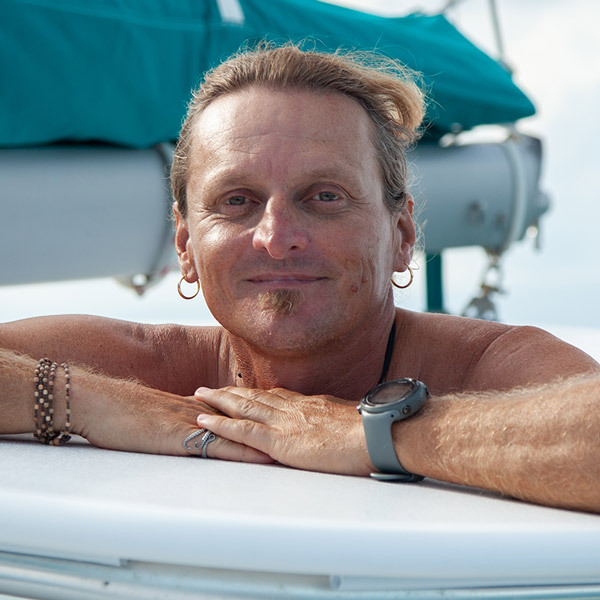 Catamarans are stable and don’t roll side to side like mono-­hull boats. DolphinQuest’s stability means nausea is rare, even for those usually sensitive to sea-sickness. 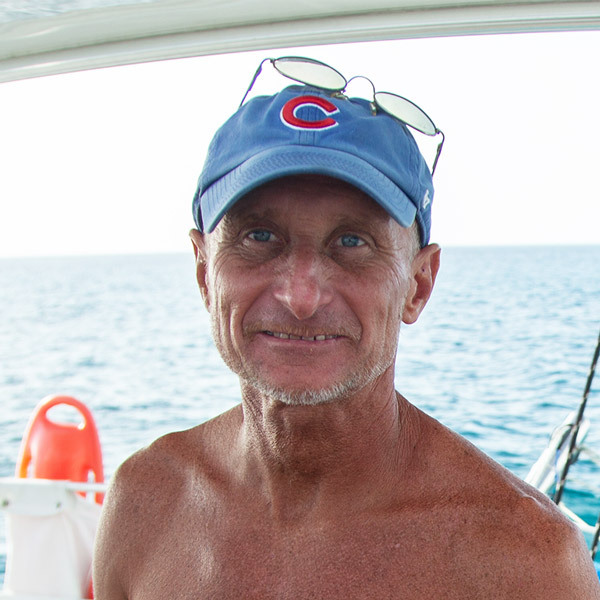 Two fully-­licensed captains take care of us on the ocean. 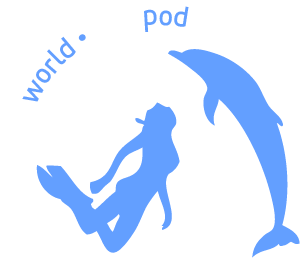 DolphinQuest is registered in the USA. She operates under The Bahamas Charter Permit for which she undergoes an annual check up and inspection every year. Safety is our priority. We familiarize everyone with the boat and safety features before we leave the dock. All crew are Red Cross trained and we have an automated external defibrillator (AED) on board. Do you need to be physically fit to join us on the WildQuest Dolphin Swim Retreat? This video will tell you more. Still not quite sure after watching the clip? Get in touch with us and we happily help you further along. After breakfast, lunches packed, we motor or sail out on our catamaran DolphinQuest, through the bay, turn north and look out for fins in the vast expanse of aquamarine waters. Everything depends on the weather and the dolphins. We spot them four out of five days, on average over the season. It’s never guaranteed. Depending on the dolphins’ mood, they love to slip into the stream at the bow of the boat and can swim with us for a while as we cruise along. We slow to a stop and send a scout in to the waters. Do the dolphins want to hang out? If yes, we gear up with snorkels, masks and fins, and slip into the water from the wide steps (transoms) at the stern. Then it’s up to the dolphins how long they stay and play. Our motto is RARE – Relax, Allow, Receive and Enjoy – in and out of the water. The more confident you are in the water, the better time you’ll have. Practice in a pool with snorkel and mask before you come, if you can. Excited adults get into the water to swim with the dolphins and awestruck, amazed ‘children’ come out. This is way beyond fun. Welcome back your innocence. Listen to your boat captain and dolphin guide at all times. Do not walk with fins. Always have ‘one hand for the boat’ to steady yourself. You are a guest, the ocean is the dolphins’ home. We do not reach out and touch the dolphins. It’s a matter of respect. Of course we do not feed them. They are very good at feeding themselves.